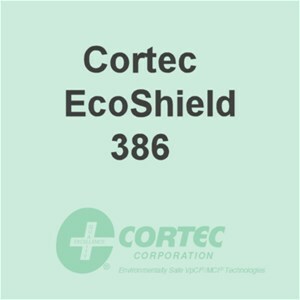 EcoShield 386 is a fast drying, water-based acrylic one coat system (topcoat) that can be applied DTM (Direct to Metal) and provides protection in harsh, outdoor, unsheltered applications. The complex mixture of non-toxic, organic inhibitors offers protection that competes with most paints and zinc-rich primers. Application: Substrate should be free of grease, oil, dirt, fingerprints, drawing compounds, rust inhibitors, or any other surface contamination that could affect adhesion. For production line applications, use VpCI®-440 or similar phosphatizing pre-treatment. For structural steel applications, Cortec recommends a minimum of a NACE #3/ SSPC-SP6 commercial blast clean. Consult Cortec and/or test system adhesion prior to full scale application. Available in 5 Gallon Pail (Cortec Item #12400318) or 55 Gallon Metal Drum (Cortec Item #12400319).